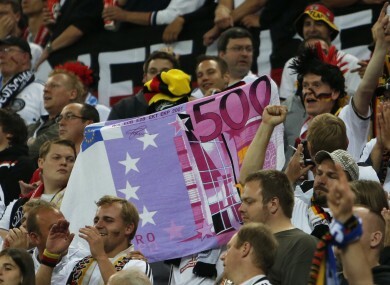 German fans display a fake €500 note during a Euro 2012 match with Greece. THE EUROPEAN CENTRAL Bank is set to decide the fate of the €500 banknote, which many people associate with money laundering, the black market and terrorist financing. But its possible abolition is raising hackles in countries such as Germany. The violet-coloured bill, the largest denomination banknote in the single currency area and physically also the bigger than the five other euro bills, is on the agenda of a meeting of the ECB’s governing council.. Notwithstanding any surprises, the council is likely to vote to stop issuing them, as the bill is believed to be favoured by criminals for moving large sums of money around without the authorities knowing. “Such notes are the preferred payment mechanism of those pursuing illicit activities, given the anonymity and lack of transaction record they offer, and the relative ease with which they can be transported and moved,” according to a recent Harvard University study. Because of its size and portability, the €500 note has become so prized in underground finance that it can trade at more than its face value, and has become known in some circles as a ‘Bin Laden’, the study said. The €500 note is “used more for hiding things than buying them,” said French Finance Minister Michel Sapin in March. “It is used more to facilitate transactions which are not honest than to allow you and me to buy food to eat,” Sapin said. According to ECB statistics, the €500 bills account for just three percent of the total number of banknotes in circulation, but 28% of the total value. Nevertheless, resistance to its possible abolition appears to be particularly high in Germany, where most people still prefer to make payments in cash. And when the euro was created, it was Germany that had been keen to have a €500 bill because it was of a similar size denomination as its 1,000-deutschemark banknote. Opponents of the note’s abolition are concerned that it would simply be the first step in abolishing cash altogether and be replaced by electronic payment systems that can be completely monitored by authorities. A number of experts have suggested that doing away with the €500 note would not be particularly effective in fighting crime. “Organised crime isn’t stupid. Most money is laundered without cash via bogus companies,” said Friedrich Schneider, an expert on the shadow economy at the University of Linz in Austria in interviews to a number of German media recently. Email “The €500 banknote looks set for the chop - but some Germans aren't happy”. Feedback on “The €500 banknote looks set for the chop - but some Germans aren't happy”.